Allahumma Ahillahu Alayna Bil’amni Wal-iman. Wattawfiqi Lima Tuhibbu Wa Tarda. such actions which You love. (O’ Moon!) My Creator and Your Creator is Allah. 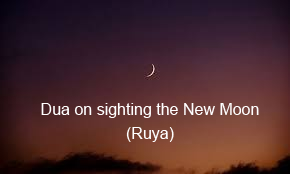 It is incumbent on Muslims to search for the moon of Ramadhan on the end of the 29th of Sha’ban. The testimony of a fasiq (flagrant transgressor) regarding the sighting of the moon is not acceptable. The testimony of a person (whose personal condition is not known) is acceptable according to Imam Abu Hanifah (R.A.). If someone sees the moon of Ramadhan alone, but for some reason his testimony was rejected, he will have to fast on that day.If he does not, he will have to observe Qadha of the fast. However, there is no Kaffarah on him in this case, if he completes thirty days for Ramadhan and the moon for Eid was not sighted, he will have to continue fasting with the people even if it means that he fasts for thirty one days. The moon for Sha’ban was sighted. The month of Rajab was completed with thirty days and Ramadhan was commenced without the moon of Ramadhan being sighted. At the end of 28th day of Ramadhan the moon or Shawwal was sighted. In this case the people have to make Qadha of one fast. The moon for Sha’ban was not sighted. However, the month was completed with thirty days and Ramadhan was commenced without the moon of Ramadhan being sighted so Sha`ban was also 30 days. At the end of the 28th day of fasting the moon for Shawwal was sighted. In this case two fasts have to be made Qadha. One should not take offence if one’s report of sighting of the moon is not accepted by the scholars. Non-acceptance of information regarding the sighting of the moon is not always because of the reporters being a fasiq or unreliable. At times the sighting of a single person or even of a few persons is not acceptable to the Shariah. Thus, rejection of testimony is based on Shari grounds. If the sky is not clear and thirty days of Ramadhan have passed then in declaring Eid-ul-Fitr there is no difference of opinion even if one person testified for the commencement of Ramadhan. There is no validity in seeing the moon in the day, whether it be before or after Zawaal the moon that will be regarded as the moon of the coming night can only be seen at night.